Murray, Joan. "Alfred Joseph Casson". The Canadian Encyclopedia, 12 July 2016, Historica Canada. https://www.thecanadianencyclopedia.ca/en/article/alfred-joseph-casson. Accessed 24 April 2019. Alfred Joseph Casson, painter (b at Toronto 17 May 1898; d there 20 Feb 1992). After study at Hamilton (1913-15) and Toronto (1915-17), A.J. 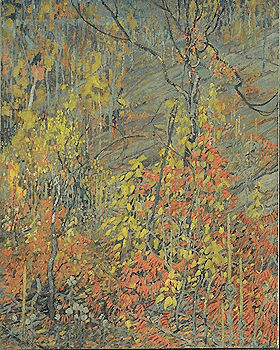 Casson got his first real job in 1919 at a Toronto commercial art firm as Franklin Carmichael's apprentice. Serigraph designed by A.J. Casson (courtesy Library and Archives Canada). Alfred J. Casson, 1933, oil on canvas (courtesy NGC). Alfred Joseph Casson, painter (b at Toronto 17 May 1898; d there 20 Feb 1992). After study at Hamilton (1913-15) and Toronto (1915-17), A.J. 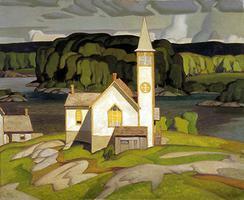 Casson got his first real job in 1919 at a Toronto commercial art firm as Franklin Carmichael's apprentice. 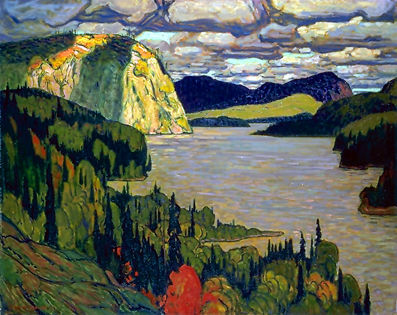 Carmichael had the greatest influence on Casson as an artist, taking him sketching and camping, and introducing him to members of the Group of Seven, including Lawren Harris and J.E.H. MacDonald. Along with Carmichael and F.H. Brigden, Casson revived and championed the watercolour medium. In 1926 Casson was invited to join the Group to replace Franz Johnston who had shown only in the group's first exhibition (1920). He also bought his first car and began exploring villages near Toronto. Ontario small towns, particularly places such as Elora and Alton, were to become his preferred subjects. 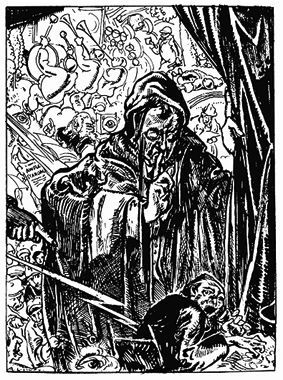 Casson's style always retained what Harris had talked to him about - simplification and the elimination of all nonessentials. This quality in his work culminated in Country Store (1945), the start of his so-called period of abstraction. Casson worked for many years as the chief designer for the printing firm of Simpson Matthews, which specialized in screen printing. His contributions to the history of graphic design in Canada were considerable. A prominent member of Canada's artistic community, Casson served as president of the Royal Canadian Academy of Arts (1948-52), president of the Ontario Society of Artists (1941-44) and served on several boards, including the Art Gallery of Toronto (now the Art Gallery of Ontario 1955-59). A modest man, he is remembered for his support of other artists and charitable organizations and his generosity in assisting students and scholars. Paul Duval, A.J. Casson (1980).